A father helps save his son through music. Monday, October 17, 7 p.m.
As a singer, connecting with someone else's lyrics isn't always easy. For Mike Massé, it was easiest when life was hardest. That's how he found himself at the piano, performing the Beatles' "Let It Be." When the first frame of Massé's video comes up on YouTube, the look in his eyes is a suckerpunch. As he sits before a black backdrop, his red-rimmed eyes—piercing and light blue on an ordinary day—are dim. Shakily, he says, "About two weeks ago, my sweet baby, 11-month-old Noah, was diagnosed with a malignant brain tumor." After a series of crossfading photos of Mike and Noah in happier times, Massé wishes Noah a happy first birthday, then begins to play. "When I find myself in times of trouble ..."
Speaking to City Weekly via telephone from Denver, where he moved in 2014, Massé breaks down. "Sorry," he says. "I'm a baby." Who wouldn't be, in his shoes? The video was his way of fighting through the fear and pain by doing whatever he could to help Noah. Since the former Salt Lake City public defender surely couldn't sue the tumor into remission, he turned to music. Massé chose "Let It Be" to acknowledge that he couldn't control the situation, but it "allowed me to take back what control I could," he says. Knowing that talking about Noah would affect his ability to get through the song, he performed before recording the introduction. "I steeled myself, knowing Noah needed it to be good," he says. The final video is nonetheless composed of multiple takes, but "people responded, so it was good enough." Now, Massé had an edge; he wasn't just another cover artist. He had performed weekly at The Pie Pizzeria's University of Utah location since 1993 in an acoustic duo with bassist/backing vocalist Jeff Hall (currently deputy district attorney under Sim Gill). 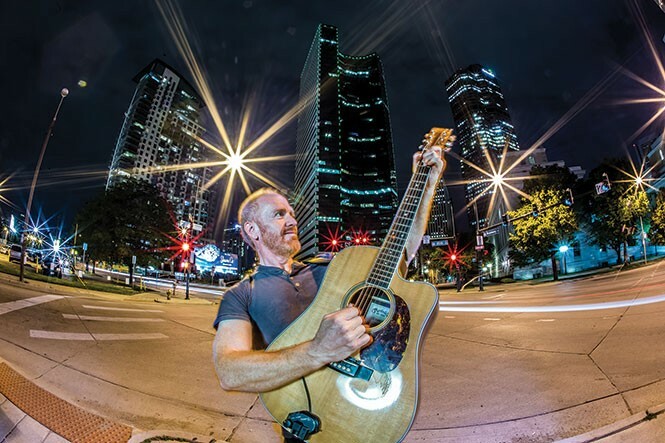 And in 2008, Massé began posting clips of his spot-on covers of U2, Pink Floyd and Radiohead, garnering real fans and out-of-state bookings—including a gig singing with former Boston guitarist and drummer Barry Goudreau and Sib Hashian. In 2014, Massé quit his 13-year job at the Salt Lake Legal Defenders Association to pursue music full-time. When Massé says people responded, it's an understatement. "Let It Be" went viral, and was picked up by the Dutch viral video site Dumpert.nl. This went a long way toward raising the money needed for Noah, who, after two major surgeries and several months of chemotherapy, is now cancer-free. The only remaining hurdle was catching up developmentally; Noah didn't walk or talk until he was 2 and a half. But after one four-hour session at the Intensive Physical Therapy Institute (IPTI) of Utah, Massé says, now fighting happy-tears, "Noah walked to me for the first time." Noah's treatment is ongoing and expensive, so Massé continues to raise money through GoFundMe.com. Of course, the uncanny quality of his music, and the increased exposure it received after "Let It Be," continues to help Massé and his wife, Valia, with their bills. He's developed a reputation as a world-class cover artist, with 125 videos, more than 151,000 subscribers and incredible view counts. "Let It Be" has nearly 850,000, and it's only the 11th most popular video on the channel behind clips like Radiohead's "Creep" (1.4 million), Simon & Garfunkel's "The Sound of Silence" (1.7 million) and the big one, Toto's "Africa," a version so compelling that it's nearing 7.4 million views. Massé now plays every weekend, often flying around the country—and the globe. In August, he was able to travel to the Netherlands to connect with his Dutch fans in person. Most importantly, it's all enabled the couple to connect with their son. This week, Massé and Noah are in town so Noah can work more with IPTI. While here, Massé will perform two shows—including a return to The Pie. He encourages people to come early; "Last time, there was a line up the stairs and down the street."